Solemn contemplation and thought about stewardship. In order for people to grow in their relationship with the Lord, they need to spend time reading and studying God’s Word. All devotional booklets are 8.5" x 5.5", feature a handsome, sturdy, glossy cover and fit easily into a 6" x 9" envelope for mailing. Click on thumbnail image for more information on each devotional. Separated into three sections: Faith, Love and Hope, these eighteen carefully written devotions illustrate and fortify the fundamental foundations of stewardship throughout the program. 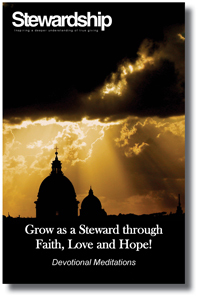 Each of the Grow as a Steward through Faith, Love and Hope! devotions includes a thematic scriptural reference and a closing prayer. They will provide encouragement and motivation for God’s people to grow in their faith, love and hope and therefore their natural commitment as a steward. Through its many scriptural references, the 20 Live a God–Pleasing Life! devotionals will enable your members to understand why, as Christians, they are to be living God–pleasing lives and how they are able to do so as they serve the Lord. 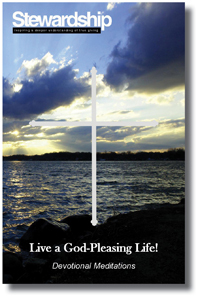 This booklet is excellent as stand-alone inspiration, or can be used with the Live a God–Pleasing Life! complete stewardship program. Through its many scriptural references, the Give It All You’ve Got! devotionals will help your members get into God’s Word. The 32 devotions provide encouragement and motivation for God’s people to use their lives, as well as their resources, to honor and glorify the Lord. May be used with the Give It All You’ve Got! complete stewardship program or as a stand-alone resource. It is most fitting that we speak of stewardship during this period of contemplation, penitence and alms–giving. It is a time of giving and doing charitable work! 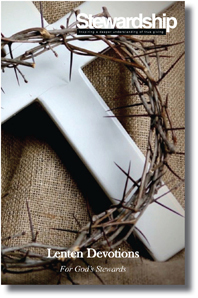 Our booklet, Lenten Devotions for God’s Stewards, will inspire a strengthened sense of faith and stewardship. Give the gift that gives back! The 40–page booklet contains a devotion for each day of Lent. Each devotion includes Scripture references and an uplifting prayer. They are ideal to distribute to every adult member of the congregation and those beyond the congregation that need a message of renewal, comfort and joy. Click Here for more information about the Lenten package! The Advent season is a time of renewal, and a time of sharing and giving. Spark a renewed sense of giving among your members with our booklet, Advent Devotions for God’s Stewards. Give the gift that gives back! 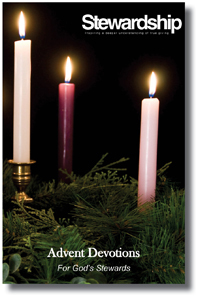 The booklet contains 24 devotions for the days of Advent as well as prayers for Christmas Eve and Day. Each devotion includes Scripture references and an uplifting prayer. 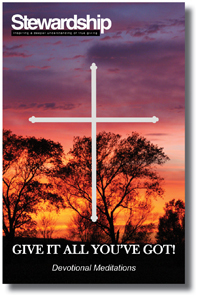 They are ideal to distribute to every adult member of the congregation and those beyond the congregation that need a message of renewal, comfort and joy. Click Here for more information about the Advent package!